Two days to buy one of the best electric cars on the market today. 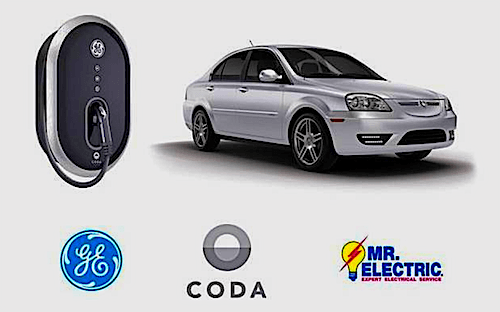 Find out how one dealership is offering the CODA at an unbeatable price. One of the best electric vehicle, EV in town packing some great all-around performance is the CODA and you can get it the next few days at an incredible discount, almost half off. If you’ve been reading our green articles on Torquenews this past year, you will have seen the word CODA floating around. Why The CODA Is Such a Great EV. The CODA is the unsuspecting winner in this EV industry. Yes, it’s not as flashy as a Tesla Model S, nor does it have the appeal of a Ford Focus Electric or a Nissan Leaf but it does sport some incredible overall performance. CODA packs a lithium-phosphate battery for good reasons. Not only are lithium-phosphates more environmentally friendly, but it yields better performance than lithium-ion. However, it comes at a higher price, hence the $39,995 before incentives. Still, $32,000+ is not a bad price for an EV you get to drive around town and highways for about 125 miles. My previous test drives have shown a car that has matured over time. My initial test drive in 2008 was very much a prototype. At the official press day, I drove a car that was much more mature. Even if some cosmetic quirks were apparent, they can easily be tweaked once into full production. However like many EV related companies, CODA has hard a hard time. For more on the subject, see our; Motor Trend Names CODA 2013 Car of the Year Contender and CODA Officially Removes The Range Anxiety for my last test drive. CODA Dealership Gets It Right. With an entry price in the EV world at the mid-high end in mind, one CODA dealership is trying to tackle the issue intelligently. It is offering a CODA at dealership price, meaning you can buy a CODA this weekend for as low as $25,890. Basically, the dealership is applying their "dealer discount" of $14,744 to your final price. Source: John Voelcker, GreenCarReport. All things considered, this is not a bad deal for what you get. We might see CODA spend more time building the other two segment until the market matures. In the meantime, now is the time to get your hands on probably one of the best EV on the market at the moment the CODA electric car at $25,890, you still get a car that will outperform a Nissan Leaf, albeit with less fanfare.